A movie based on hit Facebook game Farmville? That's crazy! Or is it? Alec Sokolow and Joel Cohen have a pretty respectable record when it comes to writing films. After all, these are the guys responsible for Pixar's brilliant Toy Story, and that earns the duo a lifetime pass from anyone who has ever cried at the beautiful friendship between a stuffed cowboy and a plastic spaceman (read: all of you). The duo's next project however, might make some of you rethink that blind praise. 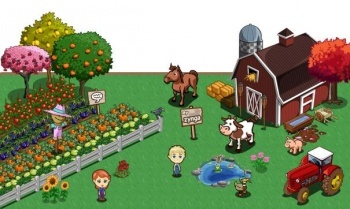 In a recent IGN interview, the pair hinted, not so subtly, that they are adapting Farmville for the silver screen. "We are also working on several new and very exciting opportunities. We're in conversations with Zynga to do something with one of their brands. Can't really say too much on that front yet, but 'Old MacDonald' didn't have a factory, if you get our drift," they said. Of course, the boys are correct. According to every version of the nursery rhyme that I've ever heard, Old MacDonald did not, in fact, have a factory. Old MacDonald had a farm. Exactly the sort of farm you might find in a place called Farmville, though I doubt the man ever planted a field of corn with the express purpose of recreating pixelated genitalia. Cynicism aside, one wonders exactly how Sokolow and Cohen might be approaching this project. The game itself has almost nothing in the way of story, and its social interaction more or less hinges entirely on bombarding your friends and relatives with pleas for building scraps and useful crops. Given the nascent status of this script, I feel safe in speculating wildly as to its content. My ideal version of this film is a stylized homage to Steinbeck's The Grapes of Wrath with a touching subplot centering on one man's efforts to overcome the predjudices of his religious, small town upbringing. Obviously he succeeds, but only after being taught how to dance by Kevin Bacon circa 1984. Oh, and because this is likely to be aimed at a young-skewing demographic, Kevin Bacon is portrayed as a CGI pig voiced by Steve Buscemi. Y'know, the more that I cobble together increasingly unlikely lies about this film, the more I realize that I would totally watch this thing. Not the actual Farmville movie that will undoubtedly be hitting theaters before the game's momentary popularity wanes -- no, that's almost definitely going to be terrible -- but instead this wildly unrealistic version that is now playing in my head. Did I mention that Michael Ian Black voices a sheep dog? He does. It's awesome.